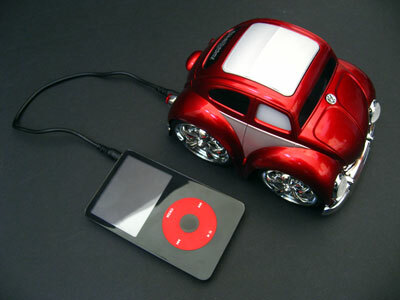 Email this VW Beetle Ipod Speaker to a Friend? 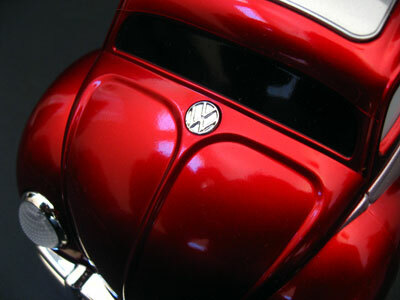 To say that adding another iPod speaker system to the mix would be overkill is a gross understatement, but when the sound machine is housed within a chromed-out Volkswagen Beetle, we can't help but notice. For those who already ride dirty in that pimped out shopping cart and rock that gold microprocessor around your neck, Jada Toys' I-Playaz VW Beetle is sure to get your motor running. Sporting brobdingnagian spinning rims, 3.5-millimeter audio input / audio output jacks that double as an aftermarket exhaust system, built-in speakers, "multicolored lights," and an on / off switch to flip those block rockin' beats on at a moment's notice, this Chub City toy can shake, rattle, and roll to the rhythm of your favorite cuts. 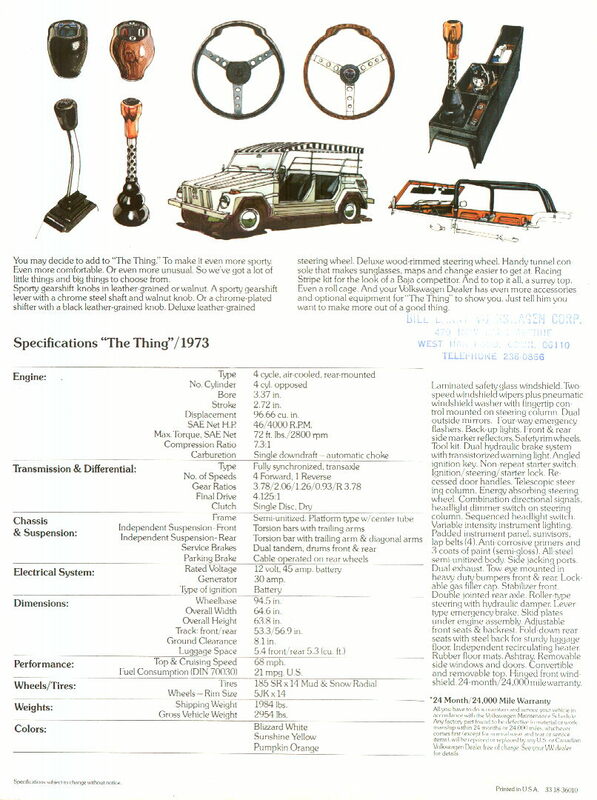 The car "moves and shakes to the beat" when your iPod (or DAP of choice) is pumping tunes through it, and there's even an built-in jam in case you want to boast about your toy while the 'Pod recharges. Although this isn't quite as fly as driving your riced-out Honda Civic around with a PSP, the bling factor here is surprisingly high for just $29.99, ya heard? Just in time for the holidays comes the Chub City i-Playaz Volkswagen Beetle from Jada Toys, a product which initially appears to be a simple replica car toy but turns out to be much more. 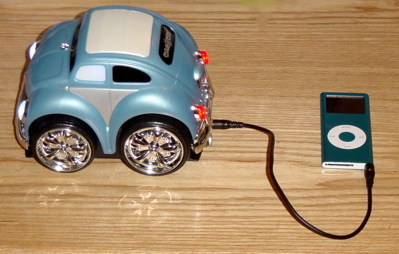 Plug an iPod into the tailpipe via the included stereo cable, and the Beetle will flash its lights, show off its hydraulics, and even play the iPod's music through its built-in speaker. 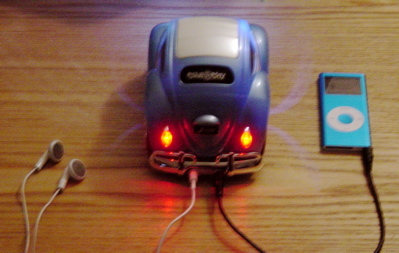 Powered by four AA batteries which are secured by screws in its underside, the Beetle flashes its front seat side windows in a recurring red-green-blue pattern as well as its headlights and taillights. 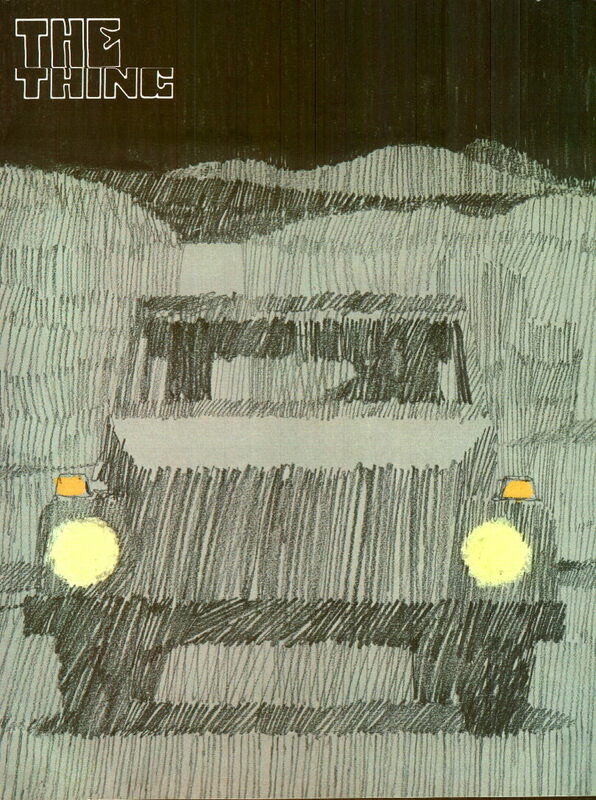 A toggle switch on the bottom makes the Beetle capable of climbing up off its chassis and swaying its entire body from left to right in a swooping motion. 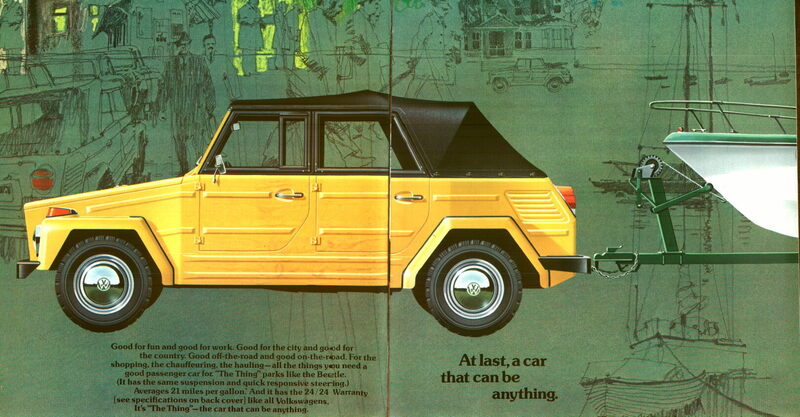 As with last year's i-dog from Tiger/Hasbro, the Beetle's willingness to get up and dance is largely dependent on how beat-heavy the music is that you feed it, although a small VW logo on the hood can be pressed in order to set the hydraulics in motion no matter how gentle the music. 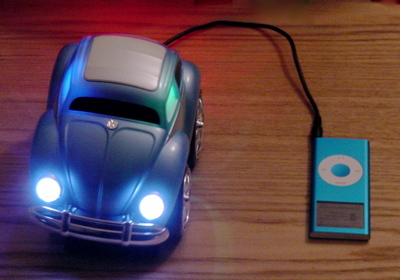 It wouldn't be fair if the Beetle got to hear your iPod's music and you didn't, so a small speaker inside the Beetle plays the music loudly enough to be heard from several feet away. The audio quality can't hold a candle to the more expensive iPod speaker systems regularly reviewed here on iProng, but nonetheless the audio quality is more than good enough for these purposes and probably sounds better than you'd expect from a $25 product. If you don't have an iPod handy, two presses of the VW logo will cue a built-in hip hop-style music track which will set things in motion. 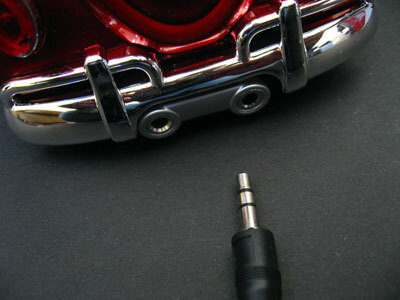 And for those times when you'd rather no one else heard your music (or more likely, you'd rather not hear your kid's music), a second tailpipe plug allows the iPod's earbuds to be connected for private listening. 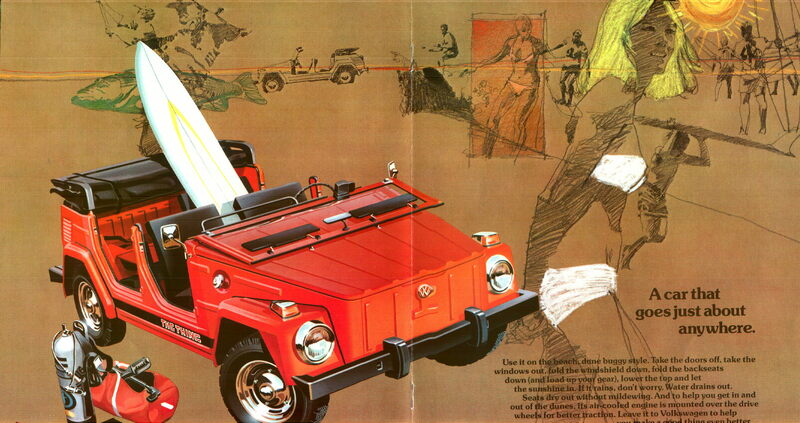 Some users may be disappointed to find that for all the hydraulic action, the Beetle doesn't actually move forward or backward from where it's sitting. But seeing how it's designed to have an iPod hooked up to it, that's probably a good thing; no one wants to see their iPod dragged around behind a car, no matter its size. While we'd like to see the audio quality upped just a wee bit, there's really very little here not to like, and plenty to be attracted to. Children in particular are likely to be enthused by the idea of being able to listen to their iPod (without having the wear earbuds) while being presented with a visual representation of the music. 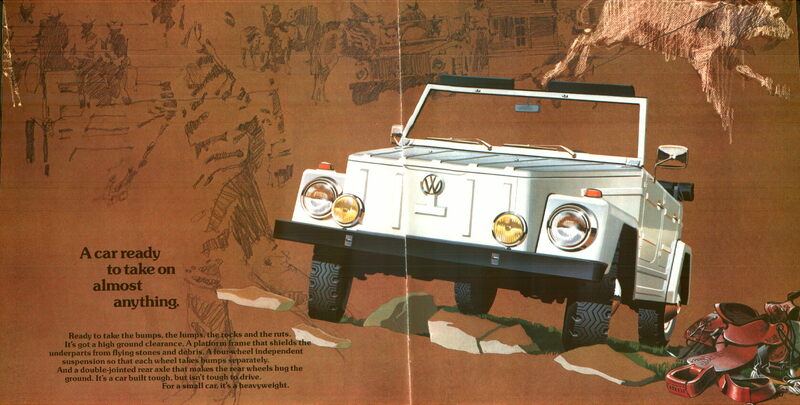 And it's a must for Beetle enthusiasts as well.